WARSAW, Poland Doctors in Poland say they have successfully completed a total face transplant only a few weeks following the victim's accident. Typically, the procedure only occurs months or even years after the incident. The urgent procedure was done on a 33-year-old man whose face was torn off in an accident which also crushed his jaws. Doctors at the Oncology Center in Gliwice said the 27-hour operation was performed May 15. 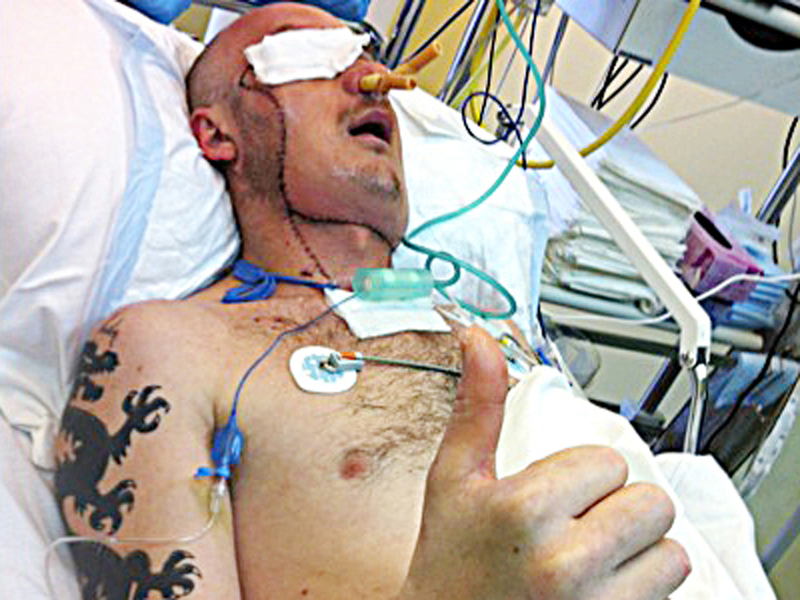 A picture of the patient taken Tuesday, six days after the surgery, showed him making a thumbs-up gesture from his hospital bed. The head of the team of doctors, Adam Maciejewski, said it was the world's first life-saving face transplant carried out so soon after the damage. Previous transplants took months or years to prepare. The surgery reconstructed the face, jaws, palate and the bottom of the man's eye sockets. Other face transplant victims around the world have had success stories. A Texan who was the first in the U.S. to receive a full face transplant after a power line accident in 2008 was recently married to a burn victim he met at a support group. A Vermont woman who was burned with lye by her estranged husband received a new face at Brigham and Women's Hospital, despite the fact that she only had a 1 to 2 percent chance of finding a perfect match for a face donor.